Some patients in England face delays of months - and in one case over a year - to leave hospital, the BBC has learnt. Hospital records suggest nearly three-quarters of NHS trusts had seen patients stranded for more than 100 days in the past three years. Those caught up in the problem said the experience had left them feeling down, isolated and frightened. But hospitals said they had been left with no choice as there was a shortage of community care for frail patients. Eileen Kirton, 85, from North Yorkshire, spent over a month in hospital after being admitted with a stomach bug. "I was isolated in a little room. I was very down. I thought I was never going come out. I was frightened." Media captionEileen: "I was over the moon, it was like winning the pools"
She said she was delighted when she finally left to move into a newly-built rehabilitation care unit. But some patients are not so lucky. The case of Iris Sibley, 89, has been featured by the BBC's Today programme. 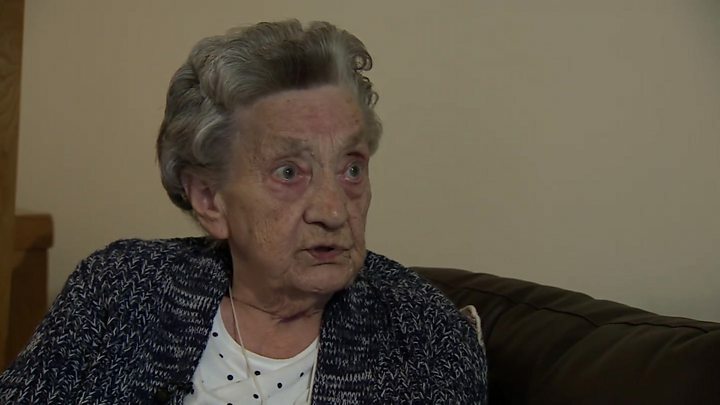 She has spent over six months at Bristol Royal Infirmary waiting for a nursing home place. Her husband, Arthur, who is 90, said: "I'm not sure that being alone in the room is good for her. We've tried all sorts of ways to hurry things up but if they can't find a vacancy, they can't find a vacancy." The BBC has also been told about another case involving a man who died while he was stranded in hospital last year. He had dementia, but was admitted to hospital with a minor health condition. Within four days he was declared medically fit to leave, but spent the next three months in hospital as sufficient home care was not available. During this time he suffered from a sickness bug and chest infections before he died. His daughter, who wishes to remain anonymous, told the BBC he spent most of the time in a room on his own and became "extremely distressed". The BBC investigation used the Freedom of Information Act to obtain details about the worst waits. Among the longest delays were stroke patients who spent eight and 10 months each waiting for follow-up care to be arranged and a patient who spent 11 months because a care home place could not be found. The single longest wait was one of 449 days a 62-year-old patient at Mid Yorkshire NHS Trust experienced. No details were given about their case. None of the identities of the patients who were stranded the longest were revealed. In total 130 patients have waited 100 days or longer to be discharged from hospital over the past three years, the data from 62 NHS trusts showed. The NHS routinely collects figures on the overall number of delays, which show the problem is getting worse. The numbers of days lost to delays has nearly doubled since 2010 to 200,000 a month. But little is known about just how long some patients are left waiting. 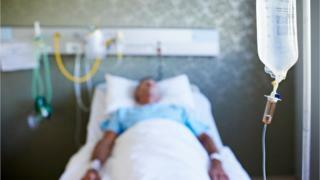 FOI requests were sent to 122 hospital trusts in England for information about their five longest delayed discharges. A total of 91 responded, but only 62 provided information about their longest delays. Of those, 45 trusts confirmed they had had patients stuck in hospital for 100 days or more. In some of these cases patients became ill while they were stranded in hospital, the responses revealed. The average cost of a hospital bed is £400 a day. Comparable figures were not available for the rest of the UK, although delayed discharges are known to be a problem in Scotland, Wales and Northern Ireland too. Mid Yorkshire Hospitals NHS Trust, which reported the longest wait, said it could not comment on individual cases. The Royal Devon and Exeter NHS Trust had five patients who were delayed for over 100 days - all were linked to a lack of social care. A spokesman for the trust acknowledged getting patients access to care packages, including nursing home places and help in the home for daily tasks, such as washing and dressing, was one of the issues. "Many of our patients are elderly with complex conditions and may require significant care both inside and outside hospital," he added. He added great efforts were being made to reduce the number of older people being admitted to hospital in the first place by keeping well in the community. Over the past four years, the number of older people getting help from councils has fallen by quarter, while the NHS district nursing workforce has shrunk by 29% in the past five years. The Department of Health suggested councils were to blame, saying there was a "thirtyfold difference" between the best and worst performing areas when it came to delays discharging patients. A spokeswoman said councils had been provided with dedicated money to fund social care. "Elderly patients should never be in hospital unnecessarily," she added. But Councillor Izzi Seccombe, of the Local Government Association, said the care system was facing a funding gap of £2.6bn by 2020. She said government policies, such as giving councils the ability to increase council tax to pay for care, fell "well short" of what was needed. Councils are expected to spend £16bn this year on social care - topping this up to over £19bn once contributions from individuals are included. Guide: Find out what's for the chop where you live?